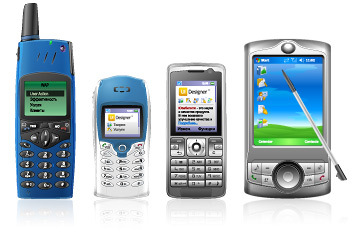 The same content or product might be displayed though several simultaneously used computer or mobile interfaces (mobile phones, smartphones or pocket PCs). Most popular mobile interfces are - interfaces of mobile internet (WAP-sites), interfaces of mobile applications (for example, on JAVA), voice interfaces IVR-menu, text interfaces of interactions SMS and MMS, text menu interfaces USSD and STK. Specifics of a portable display electronics include a small screen, slow data transmission speed, small memory volume and some other limitations, which depend on the type of used equipment (specifics of data entry, great variety of platforms and models, each having certain peculiarities and technical limitations). Currently over 20 manufacturers offer over 10,000 models of portable equipment. The number of systems and platforms they are based on exceeds 100. Nowadays it is impossible to create efficient and user-friendly interface for any portable equipment without being aware of the influence this or that equipment type produces on the product design. The price varies greatly depending on the type of applied technology, i.e. WAP or GPRS/EDGE or 3G. Data entry differs from that of a common PC with its keyboard, an array of keys and a mouse. When it comes to a mobile phone, one is to enter data using its keypad (12-20 keys, depending on a model), or a stylus / finger (applicable to mobile phones with touch-screens). Quite often some efforts are needed to switch from visual to voice interface. All these limitations (along with others) prevent web-designers or people specializing in PC interface engineering from creating relevant WAP sites, no matter how professional or experienced they are. Quite often interface development companies venture to create web interface in spite of lacking relevant qualification. While engineering such websites, they rely only on screen size and then only transmit them in WAP format. However, there is a strong risk that the website engineered in such a way will be displayed irrelevantly (if at all) or totally different from the image seen on a PC screen. The pitfalls, which are not much critical for website engineering, might become crucial with portable interface design.